Highlander technical solutions creates a framework for investors, investment managers and banks with plug & play solutions. For the investor, a dedicated confidential database account (Chinese walls) with the facility to have numerous sub accounts within Highlander Data Warehouse. Aggregated risk and performance attributions at any chosen account/strategy combination. 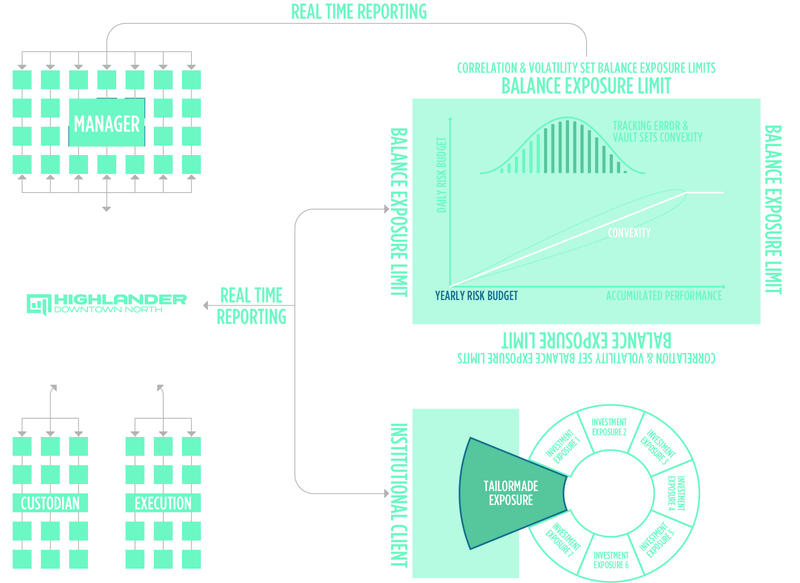 Access to flexible real-time reporting. Reduced costs, for example, cost of capital savings (not sending capital to external managers), no fund of fund extra layer of fees, no need for a third party fund facilitator to find new managers and strategies, reduced internal reporting and administration costs. Because all of the execution is via Highlander this will allow proper real-time reporting. In addition, due to economies of scale, Highlander will be in a powerful position when negotiating transaction costs which will be a potentially significant saving for the investor. For the investment manager, a dedicated database account, with the facility to have numerous sub accounts within Highlander Data Warehouse. Aggregated factor risk at any chosen account/strategy combination. Managed account structure reduces counterparty risk. With a Highlander database account, the investor can access the Highlander virtual warehouse of investment managers/strategies to search for new opportunities. Execution counterparty panel chosen by Highlander which in return for volume on a best execution basis makes Downtown an attractive proposition to the asset allocation divisions of the execution counterparties. Tailor made aggregation of any chosen combination of accounts and strategies. The client’s account created in the database is directly connected to the client’s existing prime brokerage(s)/custodial(s) account, enabling the investment management to be performed as a managed account (the majority of legal documents such as the CSA/ISDA, Credit line, IMA and Give Up documents are already in place). Only tailor made risk mandates and allocation mandates (no fund structures). All execution goes through Highlander EMS/OMS (Fix server). Highlander constantly evaluates a large number of global investment managers with different styles and strategies who are assessed as having a sustainable investment process (Highlander Investment Process DD). These on-boarded managers are available to an investor who has a Highlander account. Highlander’s simulated trading environment shows the investment managers various strategies in real-time. Investors can perform interactive studies to optimize their existing exposure into preferred exposures investing in new managers/strategies (moving seamlessly from a simulated to a real time environment). For comparative purposes, all selected managers are provided with identical risk mandates and a uniform amount of assets under management (AUM). Highlander will give investment managers access to the simulated environment to run stress tests and tests of new requested or non-requested strategies before going live. Highlander is able to collect huge amounts of data in their big data server facilities for efficient statistical generation. This technique will emphasise to the investor that they should focus on the best mix of exposure contributions from their chosen investment strategies rather than focus on best in class managers who may not improve the overall portfolio.